Laura Marie (Becker) Wallgren was born March 8, 1915 at home in Blowers Township, Otter Tail County, rural Sebeka, Minnesota. Her parents were the late Fred and Augusta (Windels) Becker. Laura was baptized on May 9, 1915. Laura attended country school and completed the course work early. Being she walked her younger brother, Lawrence, to school the teacher asked her to work with younger students. On June 6, 1936, Laura was united in marriage with Henry Wallgren at the parsonage of Immanuel Evangelical Lutheran Church in Sebeka. They made their home in Blowers Township where they farmed. In the fall of 1970, they sold the farm and moved to New York Mills MN. Henry passed away on October 23, 1977. Laura continued to live in their home, enjoying quilting, gardening and was always a gracious hostess to all who came to call. She was a lifetime member of the Bluebird Sewing Club and an active member of Trinity Church and LWML. Laura resided at Perham Living since February of 2015. 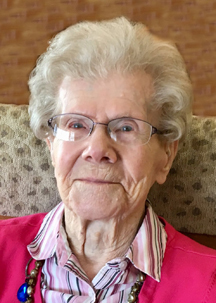 She peacefully entered eternal rest on April 13, 2019 at Perham Living, at the age of 104. She will be dearly missed by her family and friends. Preceding Laura in death are her parents; husband, Henry; son Wally Wallgren September 6, 2016; her grandsons: Kip Wallgren March 22, 1984 and Curtis Wallgren on January 17, 1999; sisters: Emelia Storien and Freda Wallgren; brothers: Heini and Lawrence Becker; daughter-in-law, Margaret Wallgren and step brother, Raymond Windels. Laura is survived by her sons: James (Dianna) Wallgren and Robert (Karen) Wallgren; daughter, Mary (Donovan) Rajdl; daughter-in-law, Jean Wallgren; grandchildren: Cheri (Dan) Tumberg, Steven (Holly) Wallgren, Tim (Sherri) Wallgren, Monica (Tyler) Woosley, Kay (Chuck) Richter, Patrick (Marin) Rajdl, Paula (Josh) Stern, Jacob (Amy) Wallgren, Jedd (Sarah) Wallgren, Kinsey (Kayla Mediger) Wallgren, Betsy (Zach) Foltz and Molly (Torrey Line) Wallgren; great grandchildren: Sam, Hilary, Eric, Tavis, Leah, Drew, Logan, Breck, Emerson, Eva, Ethan, Cooper, Grace, Lucy, Finn, Karly, Kymree, Taya, Kiptyn and Harlow; great-great grandchildren: Noah, Gracelyn, Mathilda and Drake.